Designing and using New Interval Training sessions couldn’t be easier, provided you remember to apply certain principles, which I will show you here. You can use either target-times or perceived pace for the faster repetitions. I recommend that, if you don’t already, you use perceived pace as it has many advantages over target-times, such as placing the control and responsibility for the session with the athlete, developing the athlete’s awareness of running rhythms and self-adjusting to the fatigue levels of the athlete and to external environmental conditions. You still need to accurately time and record all elements of a session, just don’t let the times drive the training. Now you’re ready to turn your existing traditional repetition training sessions into New Interval Training sessions. Once you’ve done this a few times you will start to design New Interval Sessions from a blank sheet, bringing in a greater variety of paces and rhythms to your sessions. 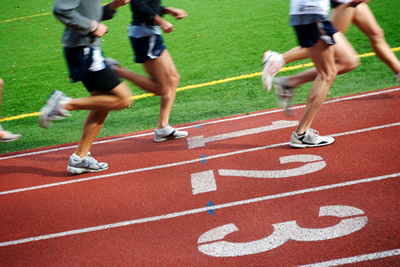 How might a New Interval Training session look in practice? Well, it might be best to think of an ordinary traditional repetition training session and converting that. Let’s start by looking at something like a classic 12 x 400m Traditional Repetition Training session at 3,000m pace with a 90 seconds recovery and make this into a New Interval Training session. Step 1 Each recovery now should become a very active ‘roll-on’ run. These roll-on recoveries should not be overly long and at a pace controlled by the athlete. As the athlete becomes fitter and their lactate shuttle abilities develop the roll-on recoveries will naturally be faster. A recovery of 100m ‘roll-on’ could be effective for this example session, where the athlete goes from the pace of the 400m to an even, easier speed for the active 100m roll-on. But the length of the roll-on could be any distance, 100m, 200m, 300m, 400m, etc. – usually from one quarter to one half the distance of the faster repetition but may be up to equal the distance. 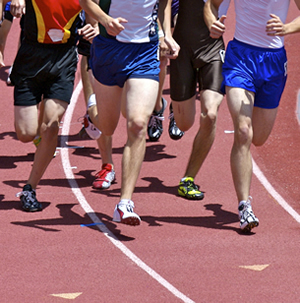 The goal, whether it’s an experienced or inexperienced athlete, would be not to slow down suddenly at the end of the faster repetition, in this example the 400m, and then speed up as the next repetition approaches but to transition smoothly and quickly from the pace of the faster repetition to the pace of the 100m roll-on recovery. For a developing athlete, and a lower number of 400m runs, the recovery 100m roll-on might naturally take 30-35 seconds or longer; whereas a senior male or female athlete may well cover this 100m naturally in 20-25 seconds. I covertly time these recoveries and if the athlete starts to deteriorate significantly from the recovery time they had commenced the set with they take a longer, less active break of 3 to 5 minutes easy running, before continuing with the set. Step 2 Reduce the pace of the session by ‘one pace’, by ‘one rhythm’, or keep the pace the same and make the session into sets. When the athlete makes an active roll-on recovery this is immediately and obviously more demanding than a passive recovery, particularly when the passive recovery is 90 seconds vs. a 100m active roll-on that might take as little as 20 seconds. Reducing the pace by ‘one rhythm’, from 3,000m to 5,000m pace in the example shown, coupled with the athlete’s active, roll-on recovery will achieve a greater physiological response than a longer and passive recovery used with repetitions at the faster pace. But you can make the session even better physiologically by making the session into sets, which can now be run at the original pace, 3,000m in the example shown. Step 3 Possibly vary the pace of the faster repetition runs in the sets and session to utilise and clear differing amounts of lactate. This makes the session even more powerful as the varied pace of the 400s in the example shown above means that each 100m roll-on is dealing with utilising and clearing differing amounts of lactate. This then combines Lactate Dynamics Training in the faster repetitions with New Interval Training, where the training effect is taking place in the recovery. Step 4 Finish each set and the session with a roll-on recovery. Since the training effect in New Interval Training takes place in the roll-on recovery, each set and the whole session should finish with the recovery interval. This also has the benefit of helping the athlete to run through the ‘finish line’ at the end of the last faster repetition and to maintain their control and composure. As you can see, there is infinite variety in the way that track sessions can be structured to use New Interval Training and even to combine it with Lactate Dynamics Training in the faster repetitions. Inexperienced and younger athletes can benefit from New Interval Training as much as the more experienced athlete but it is important to introduce the training in a way that is comfortable and achievable so that the focus is primarily on the rhythm changes. Let’s see how this might look when converting from a traditional repetition session. This means that the athlete starts out by doing 3 sets of 2 repetitions of 300m at 3,000m pace with a 100m active roll-on between the two repetitions and also after the second 300m in each set. They have 2 minutes of easy running between the sets. As the athlete gains experience with the New Interval Training the sets can become progressively longer so that it might be 2 sets of 3 repetitions, before increasing the total number of repetitions. ‘X’ x 300 (3,000) [100m r/o and 3’-5’ easy running] continue towards ‘X’ until either the athlete cannot maintain 3,000 pace or the rhythm of the roll-on interval recovery 100m slows. Take 3’ easy running and continue to total ‘X’ for the session. Example: 15 x 300 (3,000) [100m r/o and 3’] athlete does 9 x 300s before falling off the recovery rhythm - takes 3’ easy running break before continuing to do another 6 x 300s. Where ‘X’ depends on the athlete’s developmental age, training age, fitness, training stage in their programme and the need for variety. Where ‘Y’ is generally a high volume, depending on the athlete’s developmental age, training age, fitness, training stage in their programme and the need for variety. Where ‘Z’ depends on the athlete’s developmental age, training age, fitness, training stage in their programme and the need for variety. ‘X’ x 200 (1500) [200m r/o and 3’ easy running] continue towards ‘X’ until either the athlete cannot maintain 1500 pace or the rhythm of the roll-on Interval recovery 200m slows. Take 3’ easy running and continue to total ‘X’ for the session. Example: With a session of 16 x 200 (1500) [200m r/o] the athlete does 7 x 200s before falling off the recovery rhythm - takes a 3’ easy running break before continuing to do another 5 x 200s and then falls off the 1500 pace - takes another 3’ easy running break before continuing to do the final 4 x 200s to total 16 x 200s. Where ‘X’ is dependent on the athlete’s developmental age, training age, fitness, training stage in their programme and the need for variety. Many times a track is not available, or not desirable for some reason. A New Interval Training session can easily be carried out in a park or anywhere else away from the track. 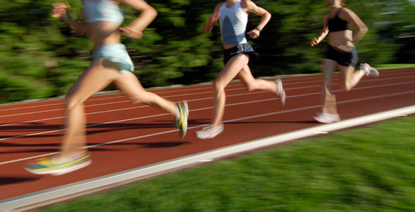 A typical session could be running for time or distance. 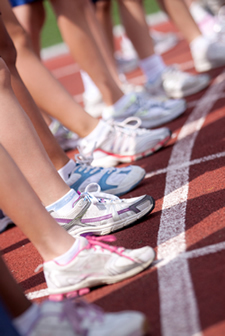 The advantage of running for time is that a large group can easily be monitored. As long as the recovery intervals are roll-on recoveries the session will be a New Interval Training session. It is easy to see that for the experienced athlete the rhythms of a New Interval Session away from the track will make a continuum into the Lactate Dynamics Training provided by Fartlek Training. A marathon runner may do a session on the roads where, for example, after a warm up of 4-5 miles they begin running alternating miles or kilometres at 10,000 pace and marathon pace, say for 10 miles or 15 kilometres, followed by a cool down of 4-5 miles. This website has focussed on the application of Lactate Dynamics Training and the New Interval Training to running, since this is where it originated. But as you read this you can see the application within other activities and other sport environments. Take the principles, apply them where ever you think appropriate and then come back to this website to share your experiences. Traditionally, the cool down has featured easy running as a key component and this should always be retained as a closing activity. But when athletes are in their late specific preparation or pre-competition phase they frequently perform sessions which accumulate high levels of lactate and acidosis. Now, something more is needed to assist the athlete’s recovery. The acidosis produced during a maximal or near-maximal effort requires time to metabolise to a base level. If this does not occur, performance in a repeat effort may be impaired. Thus, techniques to enhance and accelerate lactate utilisation and acidosis clearance are of potential benefit to any athlete. From early in my coaching career, before I knew about lactate dynamics, I started using what are now referred to as ‘extensive repetitions’, immediately after any speed endurance session. An example of such a traditional repetition training speed endurance session for a senior athlete might be: three sets of four repetitions of 200m, where the 200s are run at increasing speed from 800 pace to a maximum effort on the fourth repetition. There is 30 seconds between the repetitions and 5 to 8 minutes between the sets. Once an athlete has performed extensive repetitions a number of times and felt and learned how much quicker the recovery is for the next session, they initiate the extensive reps themselves and perform them willingly. They all agree, however, that the first two of these ‘extensive repetitions’ continue to be “an effort” but all are surprised how, after 4 to 6 of these 200s, they really have accelerated their recovery and begun the process of adaptation to what they have done in the session. Remember that the improvements in fitness and performance come from the quality of the adaptation to the training, not the training itself. Let’s now take this principal of accelerated acidosis clearance and apply it to the championship setting for events which accumulate high levels of lactate and acidosis. The quality of the performance in each subsequent round in a championship is directly related to the quality of the cool down from the previous round. This is as true a statement whether it is for several events on a single day, or a single event repeated over a number of days. If we accept the statement about preparing for the next round we had better ensure that lactate utilisation and acidosis clearance have been optimised in the cool down. Enter again, the extensive repetitions to provide this service. It may be harder to find the appropriate place at a championship since the track is being used for competition. But it doesn’t matter where you do the extensive repetitions, as long as they are done as soon after the event as practical, and are at the appropriate duration and intensity, which is approximately 40-60 seconds at 10 km pace. Research has focussed on the 'cool down' for some time and the results from various sports since the late-80s have supported this concept of the benefits of a more active cool down, particularly after maximal or near-maximal efforts. In swimming, for example, Dr W. McMaster, et al in 1989 demonstrated that “swimming at 65 per cent of maximum velocity significantly improved lactate and acidosis clearance over passive resting.” The results confirmed that active cool down swimming returned lactate values to near resting levels. Good research is usable research and good practice by coaches in the field innovates ahead of research but perhaps can point the way towards future and better cooperation between coaches and researchers. Pace has been used throughout this website to be equivalent with Bill Bowerman’s concept of ‘Date pace’. Pace can be used as a guide for an athlete’s running rhythms for their continuous training, repetition training or interval training. For example, ‘800m pace’ means the running rhythm for this repetition will be the same rhythm as the athlete would have used if they had been racing in a 800m race that day. But this should be their 800m mid-race rhythm and not their 800m finishing pace. Coaches planning training for running sessions should avoid using ‘target times’ for their athlete’s repetition training. For example, a 36 seconds target time for 200m might be an ‘easy’ effort for an athlete on a day when they are ‘fresh’. The same time of 36 seconds may feel much harder and produce a different physiological response, or be unachievable for that same athlete, if the athlete is very fatigued. If we look at another pace as an example: ‘3000m pace’ means the running rhythm for the repetition will be the same mid-race rhythm as the athlete would have used if they had been racing a 3000m race that day, the day of the actual training, not their personal best for the distance. For example, an 82 seconds target time for 400m might be an ‘easy’ effort for an athlete on a day when they are ‘fresh’. The same time of 82 seconds may feel much harder and produce a different physiological response if the athlete is very fatigued from training, from other things in their life or if the weather is not good through wind, rain and/or temperature. Using running rhythms and ‘pace’ means that the speed of the repetitions is adjusted each day to the athlete’s fitness and energy levels. With training groups, using target times may fit one or two athletes in the group but not most of the athletes in the group. Using ‘pace’ means that every athlete trains at their individual rhythm and level of performance, developing the fitness that they need. Pacing can suffer another consequence when it is compared to an external criterion, a target time. Whether this is given at some interim point in a run or as the finishing total, these times are ‘history’ and only represent the average velocity over the distance run. I have observed many coaches provide their athletes with extrinsic feedback in the form of stopwatch times and accept them slavishly as being an accurate reflection of ‘pace’. I have, for example, covertly timed athletes who have been running repetitions in training of 400m in 68 seconds. As long as they achieved “68 seconds” this was considered success. However, when I timed the athletes’ 100m or 200m splits they frequently exhibited 33 seconds or faster for the first 200m and 35 seconds or slower for the second 200m. They thus achieved the criterion of 68 seconds but were, in reality, ‘training to slow down’. Even when the athlete accurately achieved the 68 with a consistent velocity this grooving in of a time-controlled pace can result in what was well described by a term I encountered in the USA in the 1970s, ‘pace-lock’. In races, these athletes who have ‘pace-lock’ can reproduce a certain pace in a skilled way but lack the ability to respond to the race’s demands as they are uncomfortable running slower or faster than their learned, timed pace. Running lends itself to a great variety of learning environments. If we look at how I currently approach the technical development of endurance athletes, from 800m to marathon and beyond, you would find that athletes are frequently exposed to at least four variations of ‘Running Rhythm’. This exposure is within a single session and even within a single repetition. Experience has shown that athletes of all abilities have a greater or lesser sense of rhythm, just in the same way that some individuals are naturally more ‘musical’ than others. Experience has also shown that all athletes can develop their sense of rhythm, in the appropriate environment. The rhythms that I use are tied to perceptions related to in-race rhythm, not target times. A group of novice athletes might be set the challenge, “I would like you to run at your own rhythm and run this next 400m on your own and with the first 100m at 10,000m pace, the next 100m at 5000m pace, the next 100m at 3000m pace and the final 100m at 1500m pace. If the athletes do not have the experience to imagine how they would feel at the various distances they can be asked to run each 100m slightly faster than the one before and to finish as they would feel in the middle of a 1500m race. The participating coaches on courses and workshops are frequently scornful that athletes can achieve this task without being given splits from a coach and then are subsequently surprised when they observe that the athletes can actually find these ‘gears’. For this technical training the runners should not wear or look at watches. Times are recorded by the coach but not given within repetitions, although they may be occasionally, between repetitions, since the emphasis is on developing an awareness of internal processes. This simple learning task is presented as A, B, C, D within a single repetition. Once they have done this, the athletes are asked, in the same session, to run for example 1200m with 100 metres at A, B, C, D, A, B, etc. The most difficult transition is usually from D to A but the athletes quickly learn this. It does not matter so much that the pace they are running at is accurately ’10,000m’ or ‘3000m’ but that the differentials, the ‘gears’, are exhibited. Using the ‘Four-seconds Rule’ of Frank Horwill, we know that 800m, 1500m, 3000m, 5000m and 10000m all potentially vary by 4 seconds per 400m, or by 1 second per 100m, and this is the order of variation we observe for club to international level athletes. For slower performers the differential may be 5-seconds or more but the ‘gears’ are all related one to the other, the same as for an elite runner. Once athletes can achieve a simple A, B, C, D practice they can move on to much greater variety over different distances – e.g. B, D, A, C, D, etc. They can also practice this variety within and between repetitions. Initially, this technical rhythmic training should be done at the beginning of a session before moving to some simpler repetitions for their ‘fitness’ work. As experience grows and fitness improves, what was ‘technical work’ of playing with rhythms becomes the whole session. Having read about how you can use it, try the New Interval Training for yourself. Try making recoveries more dynamic, and the whole session more rhythmic, dictated by the perception of pace, rather than slavishly following a stopwatch. As you do, the ability to judge pace and run at various rhythms will improve but, most importantly, with this New Interval Training your competitive performances will really take off.